Pro Tip: "This product contains Dimension Herbicide which prevents crabgrass seeds from growing and also kills newly sprouted crabgrass. This is a nice feature if you are just a little late applying it." Hi-Yield Turf and Ornamental Weed and Grass Stopper contains the pre-emergent herbicide, Dithiopyr, also known as Dimension. This product helps to prevent broadleaf and grassy weeds such as crabgrass from developing. 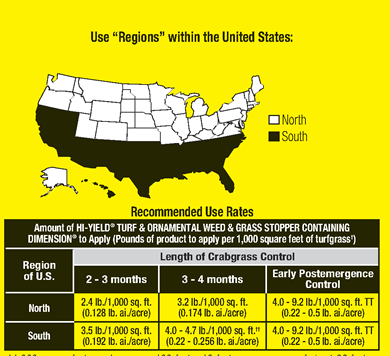 It can be applied up to 4 weeks later than other crabgrass preventers. It is ideal for use in established lawns and ornamental areas, providing three to four months of residual control. It also controls or suppresses other listed weeds when applied before their germination. It continues to provide control of crabgrass up to 4 weeks after germination. It may be used on cool season grasses and warm season grasses. It may be applied in the spring or fall months. See label for the complete instructions. 12 lb. treats up to 3,500 to 5,000 sq. ft. This product contains Dimension Herbicide which prevents crabgrass seeds from growing and also kills newly sprouted crabgrass. This is a nice feature if you are just a little late applying it. Annual grass and Broad-leaf weeds such as crabgrass, barley, goosegrass, hermit, bittercress and other listed grasses and broad leaf weeds. Warm-season Grasses: 3.5 - 9.2 lbs. per 1,000 sq. ft.
Do not apply more than 9.2 lb. of this product per 1,000 sq. ft. per application and no more than 27.6 lb. of this product/1,000 sq. ft. per year (equivalent to 0.5 and 1.5 lb. of active ingredient per acre, respectively).